The advancement in science and technology contributes directly or indirectly to the increase in waste and toxic materials in the environment. Thus it is required to clean up the contaminants of the environment by eco-friendly, sustainable, and economically adoptable technologies. Present treatment technologies, though efficient, cause several problems which make remediation processes complex. Bioremediation requires long treatment time, and it may not be effective if high contaminant concentrations that are toxic to microorganisms exist. The integration of nanomaterials and bioremediation has great potential to be effective, efficient, and sustainable. 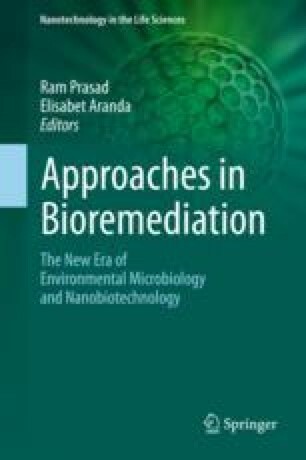 Thus use of nanotechnology for bioremediation is a new emerging field, playing an increasingly important role in addressing innovative and effective solutions to a vast range of environmental challenges. The use of nanomaterials for remediation/treatment results is more cost-effective and rapid than current conventional approaches due to their enhanced surface area, transport properties, and sequestration characteristics. Recently nanoscale zero-valent iron (nZVI), carbon nanotubes, and nano-fibers have been used for the remediation of a variety of contaminants including chlorinated compounds, hydrocarbons, organic compounds, and heavy metals.